Our Origins: Why is Niche here? If someone had told at the onset of my college career that in four years I would opt out of attending a prestigious MFA program in creative writing and instead graduate into a depressed job market, I would have laughed. I had wanted to attend an MFA program in creative writing since I was eleven years old, but had not prepared to be rejected by almost every MFA I applied to. Wounded pride prevented me from seeking alternative career options, leaving me with a job that was set to expire at the end of the summer and five months until I entered repayment on loans. In other words, I was in the same boat as the thousands of students who had graduated with me. I moved back in with my parents and began the demoralizing search for a job. During one sleepless night, I asked myself what I really wanted from my life, besides becoming a published and well respected author, and the thought of starting a literary magazine surfaced. I could be a publisher. The idea thrilled me but fear followed immediately. I feared people would find me pretentious once they learned I had less than six publications to my name and few connections to the publishing world. I was not arrogant enough to believe I knew anything about running a literary magazine. A fifteen-year love affair with writing, four years of writing workshops, and inexhaustible support from my family and mentor, had given me confidence in my ability to recognize quality work, but I realized being passionate was only half of it. 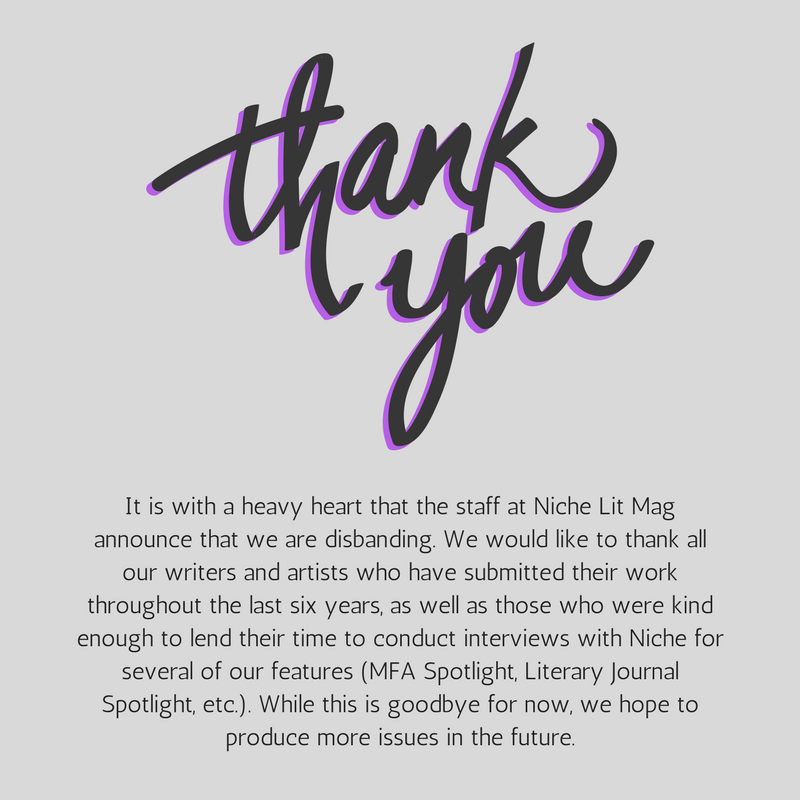 Founding a literary magazine also required knowledge of business management, a team of artists and designers, an outgoing personality, and the courage to become an entrepreneur. I tried to push it from my mind, but the idea was still there come morning, and I found myself confessing it to my family that afternoon. My parents were enthusiastic. They’ve always believed that if someone followed their life passion, it would lead to good things. I sought a reality check. “I think you should be putting all your time and energy behind Niche,” my mom said. My parents were serious about their support, my friends were serious about committing to the project, and I realized it was time to conquer my fears and get serious as well. If I wanted to launch a successful literary magazine I’d have to put all my efforts behind it. On the same day that I launched Niche’s website, Evanescence’s new single, “Do What You Want” was released. I took it as a sign from the universe that I was following the right path at last. This post was originally published on Niche’s website on September 24th, 2011.